2017 Christmas Cards Are Here! I know, I know, it is only October. Christmas is months away still! And that is true, but it isn’t too early to start thinking about your Christmas card. Plus if you get them now, you have plenty of time to get them addressed and sent without any stress. I added 2 new Christmas Card designs this year on top of the 4 I did last year (one of which I updated a little) so you have 6 designs to choose from for Christmas 2017! 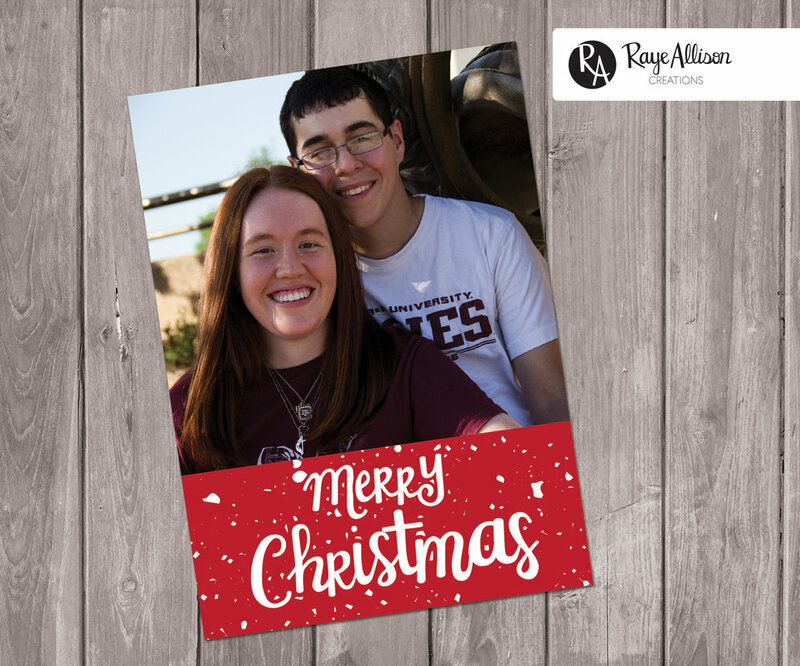 The two newest Christmas Cards from RayeAllisonCreations are the “Joy To The World” holiday greeting card and the Christmas Presents Photo Card. Both can be personalized and customized in different ways. On the “Joy To The World” card, you can either keep the Joy to the World greeting on the front or choose your own. I provide some examples of other greetings in the listing. On the Christmas Presents Photo Card, you provide the 4 images you want to include in the presents and then you can change the present outline & bow colors as well as the greeting in the top left corner. I also added an updated version one of my Christmas Cards from last year. You can now get the Christmas Tree Card with different font styles of the original greeting, “May your days be merry and bright.” You can also choose a different greeting if you want to. Of course, all of the cards from last year are still available and are ready to be personalized just for you and your family. 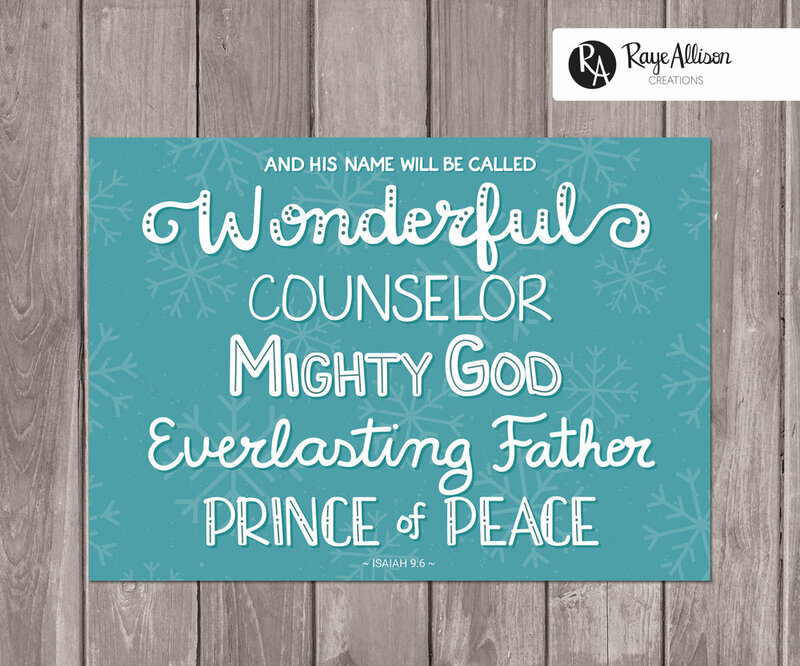 Choose from the minimal single photo card with a holiday greeting, the card your family as ornaments, the cute landscape scene with colorful Christmas trees and a fun greeting, or the digitally handlettered Isaiah bible verse card. Check out the full collection of Christmas Cards in my Etsy shop and let me know if any of them strike your fancy. Get a jumpstart on the Christmas to-dos to ease some stress later! Which of the cards is your favorite? Also, if you are interested in free weekly printables to add to your home decor, you can subscribe below to my Printable Creations. Every week, I send out a new colorful and inspiring printable that you can print and hang in minutes. Hope you have a great week!